Scrooooge!, a floral show based on the Dickens holiday classic, opens at The Domes Nov. 17. 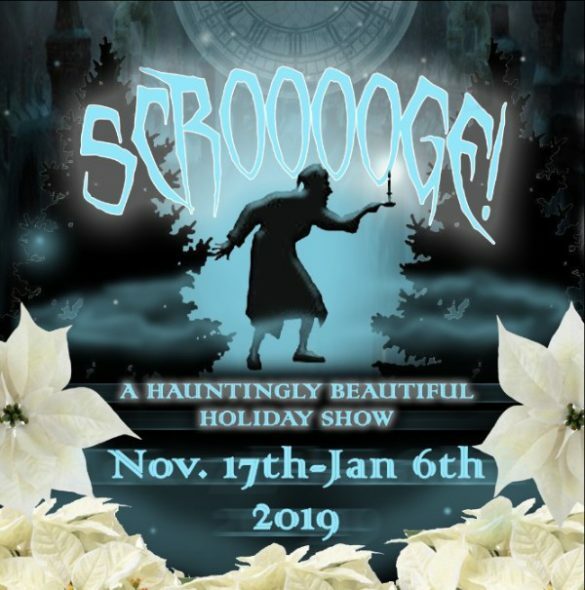 MILWAUKEE – Visitors will travel through holidays past, present, and yet to come as they follow the spirit-filled journey of Scrooooge!, the floral show opening Nov. 17 at The Domes, 524 S. Layton Blvd. In this visual retelling of A Christmas Carol by Charles Dickens, visitors encounter scenes inspired by each of the ghosts who visit Ebenezer Scrooge. The Ghost of Jacob Marley, the late business partner of Scrooge who wanders the earth as punishment for his greed, is represented by a tree with heavy, metal ornaments and garlands of chains and gossamer fabric. Next, the Ghost of Christmas Past takes the form of a snow queen, with a skirt of evergreen boughs, while nearby silhouettes of children refer to Scrooge’s childhood. The Ghost of Christmas Present, who embodies the sharing of riches, is depicted as a Victorian Santa next to a festive tree and banquet table with glittering gold highlights. Also referring to the present is a scene in the Cratchit home, with a meager tree decorated in simple, handmade ornaments. The Ghost of Christmas Yet to Come, who leads Scrooge to a moral reckoning, is symbolized by haunting, bare trees leading to a gravesite scene, where a silhouette of Scrooge tips his hat as he vows to change his ways. Surrounding the scenes will be the latest varieties of poinsettias—many of which are not yet available to the public. Colors selected relate to the scene: white for the winter setting, deep red for the story’s solemn themes, and gold for the celebratory aspects. Since 1965, when then-first lady “Lady Bird” Johnson cut the ribbon to open the Floral Show Dome, families have made a tradition of visiting the annual holiday display at the Mitchell Park Domes. The holiday floral show is one of the most popular shows of the year, last year drawing 46,088 visitors. While shows in the early years focused on massive displays of poinsettias, shows in more recent years have added props and vignettes as a means of storytelling to enrich the experience. Just as in the past, The Domes will offer the show as a beautiful backdrop for families to capture memories in photos. Families who would like to take formal photos, for cards or other uses, may purchase a photo permit. For details, call The Domes at 414-257-5600. 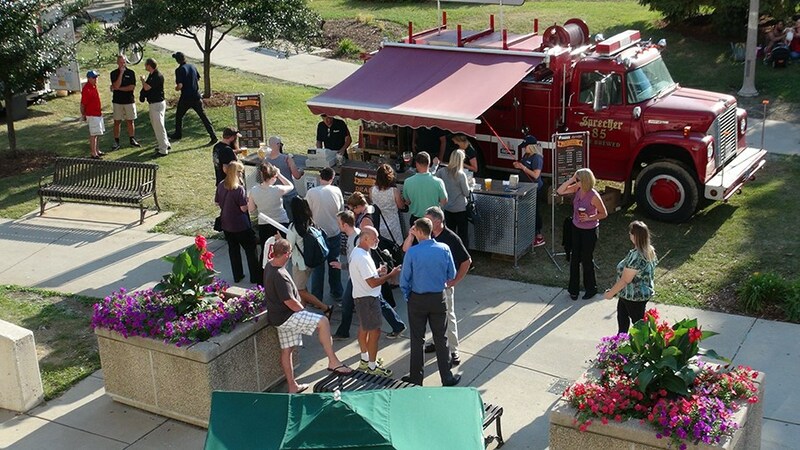 Two events will add to the magic of the season. Guests from the North Pole will make appearances and a holiday concert will be performed. Santa, Mrs. Claus, and Rudolph will visit Dec. 9 and 15 from noon–3 p.m. to greet good girls and boys, and to give parents the opportunity to take snapshots. Dec. 16 at 1 p.m., David HB Drake will give a holiday performance, Let There Be Light. The concert offers a seasonal collection of little-known folk songs played on handmade instruments. Drake’s program gives a gentle look at the holiday season. Details are available at davidhbdrake.com. 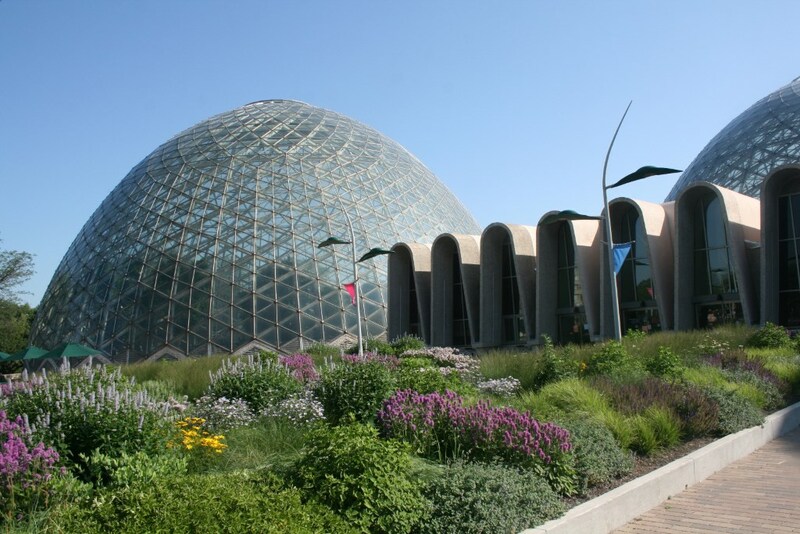 Hours of The Domes are Monday–Friday, from 9 a.m.–5 p.m., and Saturdays, Sundays, and holidays from 9 a.m.–4 p.m. The 2018 admission fees range from $5 to $8. When presenting IDs for proof of status, Milwaukee County residents, students of all ages, and people with disabilities receive discounted admission. Children age 5 and under are admitted free. In addition, Milwaukee County Residents with proof of residency receive free admission on Mondays, from 9 a.m.–noon, excluding the celebration of major holidays. Scrooooge! runs through Jan. 6, 2019. For more information, call The Domes at 414-257-5611 or visit countyparks.com. Urban Garage Sale, in The Domes Annex, Nov. 24–25, from 10 a.m.–4 p.m. Details at urbangaragesale.com. New Year’s Eve Family Celebration, Dec. 31, from 6–9 p.m. Details at milwaukeedomes.org. Winter Farmers Market, in The Domes Annex, Saturdays from 8 a.m.–noon, through March 30. No market will be held Nov. 24 and Dec. 29. Details at mcwfm.org.